The throat is the crown of your digestive system. 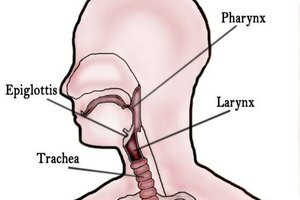 At the very top, it is the first section that greets your food and drink and passes them down to the esophagus, the muscular tube connecting the throat and stomach. A throat filled with toxins can cause a host of problems, including bad breath, general soreness and difficulty swallowing. Such conditions can be caused by poor eating habits as well as smoking and chewing tobacco. From time to time, it is necessary to cleanse the throat just as you naturally cleanse other parts of your digestive system, such as your colon through excretion. Stir two tablespoons of sea salt in a pint glass of water. Standing in front of your bathroom sink, take a big sip, tilt your head back and gargle for as long as you can. Spit the saltwater into the sink. Do not swallow it. Swallowing the saltwater and toxins will just re-pollute your body. A saltwater gargle is useful if you need to cleanse your throat because of post-nasal drainage from a bacterial sinus infection. If this is the case, the mucus that is withdrawing from your nasal cavity is chemical-laden and leaving a residue and irritation as it drains. Gargling with saltwater can help purify the throat of these elements. Mix one tablespoon of apple cider vinegar in a glass of water. Take a big sip and gargle with the mixture. Then spit it into the sink. Gargle again, swallowing the mixture this time. Continue this process until the vinegar-water is gone. Apple cider vinegar contains acetic acid, which will kill any bacteria lining your throat or farther along your digestive tract. Peel a piece of ginger root the size of your thumb. Slice it into coin-shaped pieces and add it to a pot of boiling water. Allow the water to cool and the ginger root to seep properly. Sip the water-ginger mixture slowly, adding honey if you wish. After finishing the mixture, chew the remaining pieces of ginger. Do not swallow the ginger. Ginger is an all-natural expectorant and will assist in removing pollutants from your throat. Diluted garlic paste works for some people, too. Add a teaspoon of garlic paste to a glass of warm water and sip the mixture slowly. Eating yogurt with active cultures can help cleanse the throat; the active cultures consume the bad bacteria living in the throat and the rest of the digestive tract.